Do you ever wonder about the things in the sky “ the Sun, the Moon, the stars? People have been watching the sky for a long time, trying to figure out what is out there. We keep coming up with new ways to learn more about outer space. Now, we send rockets into space to learn more. Astronauts travel around the Earth. Some of them have landed on the the Moon. Robots can fly to other planets to take pictures. We can see things that people like Copernicus and Galileo could only dream about. We can use very strong telescopes to see what has happened to other stars. We compare pictures of distant stars with pictures of the Sun. We can use thousands of pictures of the planets to learn more about Earth. We use what we learn about all the things in the Solar System to figure out how it was formed. We can also guess what might happen to it in the future. At the center of the Solar System is the Sun. It is a star, like the billions of other stars in the sky. The other stars are very very far away, so they look tiny. The Sun is important to us because it gives us heat and energy that allows life. None of the life on Earth could exist without the Sun. 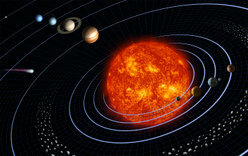 The rest of the things in the Solar System orbit (travel around) the Sun. The planets are the largest of these. Each planet is a little like the Earth. But the planets are also very different from each other. Many of the planets have moons. A moon is like a small planet. Mercury has no moons. Earth has one. Jupiter has 63! The planets closest to the Sun are called the inner planets. These are Mercury, Venus, Earth and Mars. Then comes a big ring of asteroids, chunks of rock much smaller than planets. This ring is called the asteroid belt. Then come the outer planets: Jupiter, Saturn, Uranus, Neptune and Pluto. Beyond the orbit of Neptune is another big ring of things like the asteroids, called the Kuiper belt. Kuiper (said "KYE-per") was the last name of the person who first wrote about it. Most of the things in the Kupier belt are hard to see through telescopes. In between all the other things is dust. The pieces of dust are very far apart, but they shine in the light of the Sun. Before dawn in September or October, they glow in the east. We call this the zodiacal glow. When pieces of space dust hit the Earth's atmosphere, they burn brightly. We call them shooting stars or meteors. Beyond that is a lot of empty space. The nearest star to our Sun is thousands of times further away than the size of the entire solar system. The Universe is a really huge place! Why do all of the planets orbit the Sun? Why do moons orbit planets? Why doesn't the Sun move off and leave the planets behind? The answer to all of these questions has to do with gravity. Gravity is a force that is a property of mass. It pulls things together. We don't notice the pull from the Sun because it is so far away. But the Sun's gravity is strong enough to keep the Earth from shooting away. Even though the Earth is going fast, it keeps turning to go around the Sun. It is like they were tied together with an invisible string. In the same way, moons orbit many of the planets. They are kept there by gravity. The Sun itself does not sit still in space. 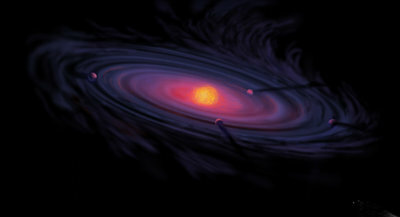 The entire Solar System is orbiting the center of our galaxy. The whole thing stays together because of the force of gravity. Mass just means the stuff every thing is made of. Two bananas have twice the mass of one banana. The more mass a thing has, the more gravity pulls it and the more its gravity pulls other objects. We don't notice the pull from a banana because it is so much less than the pull from the Earth. If you stand on the ground and let go of a banana, gravity will pull it down towards the center of the Earth. It will hit the ground. If you could throw the banana hard enough at the right angle, it would go into orbit around the Earth. That is how rockets put astronauts into orbit. If you threw the banana really, REALLY hard in the right direction, it would fly away from Earth and never come back; but our arms are not that strong. Anyone who looks up at the sky enough on clear nights can see seven bright objects. These are the Sun, our Moon, Mercury, Venus, Mars, Jupiter, and Saturn. People have known about them for a very long time. Ancient people thought they were related to gods. In Babylon, they named the days of the week after them. Almost everyone was sure that all these things were orbiting the Earth. They did not know we lived in a Solar System. In 1543, Nicholaus Copernicus figured out that the planets orbit the Sun. Only the Moon orbits the Earth. But he was afraid to say so for most of his life. Then Galileo Galilei pointed a telescope at the sky. He found moons orbiting Jupiter. He was certain Copernicus was right, and he got in trouble for saying so. It took seventy years to convince scientists that the planets orbit the Sun.. Now, almost everyone on Earth understands that we live in a Solar System. People made better telescopes and found more things in the sky â€“ moons, new planets, and asteroids. More things are being found today. Recently, astronomers found some things a lot like Pluto. One of them, called 2003 UB313, is bigger than Pluto. Maybe it should be called a planet. Maybe Pluto should not be called a planet any more. How have we explored the Solar System? The Sun's image shines on a sheet of paper in 1625. 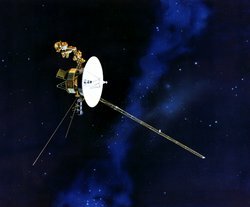 The voyager 2 space craft. Before the telescope, people explored the sky with their eyes. They saw how the planets seemed to "wander" through the sky. They learned to predict where the Sun, the moon, and planets would be in the sky. They built some observatories -- places for watching the sky. They watched the Sun and stars to tell the time of year. In China, they even knew when the moon would block the Sun. Most people thought that celestial bodies could cause war or peace on Earth. 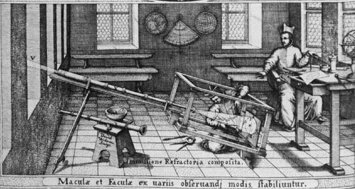 After telescopes were first made, people kept making them better. Astronomers saw that planets are not like stars. They are worlds, like the Earth. They could see that some planets have moons. They began to think about what these worlds were like. At first, some thought that the other planets and moons had people or animals living on them. They thought about how it would be to live on these other worlds. Then they made telescopes better and saw that there are no plants or animals on the Moon or on Mars. Now, we can explore by going to some of the other worlds. 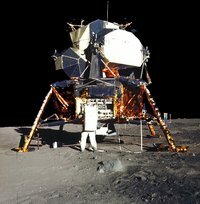 Twelve Astronauts walked on the Moon about 30 years ago. They brought rocks and dirt back to Earth. Spacecraft flew by Venus, Mars, and the outer planets. The pictures they took showed us a lot of what we know about these worlds. Robots landed on Mars in 1971, 1976, and 1997. They took thousands of pictures of the planets. Two robots, "Spirit" and "Opportunity", are working on Mars right now. They send photos and movies back to Earth. They also check rocks to find out what the rocks are made of. So far, we have not found any life except on Earth. Maybe tiny one-celled life once lived on Mars. Maybe there is life under the ice on Jupiter's moon Europa. New spacecraft are being planned to look for life on these worlds. Our Solar System is part of the Milky Way galaxy. Galaxies are big mixes of dust, gas, stars, and other things. Inside our Milky Way galaxy are clouds of dust and gas where stars are born. Our Solar System was created in this kind of cloud. A part of the cloud began to get smaller and less spread out. It formed a big, spinning disk of gas and tiny pieces of dust. This disk was thickest at the middle. The middle slowly collapsed until it became the Sun. We are still trying to learn how the planets were formed. Most scientists think that they were formed from the left over gas and dust. The Sun and planets start to form out of a disk of dust and gas. This is how it could have happened. The rest of the disk continued to spin around the Sun. The tiny pieces of dust hit each other and some of them stuck together, next the bits of dust slowly collected to form grains, these in turn joined to form lumps the size of gravel, then pebbles, and then rocks. The rocks crashed together into mountains. The mountains crashed together to make bigger things. These big things swept up most of the rest of the disk to form the planets, moons, and asteroids. What will happen to the Solar System? 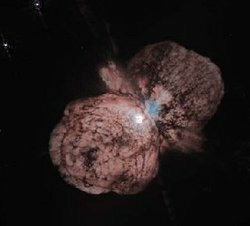 The massive rapidly aging star Eta Carinae throws off a giant cloud of gas, forming a planetary nebula. In about five billion years, the Sun will use up most of its hydrogen fuel. It will enter the final stages of its life. It will collapse, and then the outer layer of the Sun will expand. It will form a red giant. It will be so big that some of the planets will be inside it. These planets will burn away. Which planets get destroyed will depend on how much mass the Sun loses. A strong solar wind will blow some of the outer layers of gas away from the Sun. The Sun will have less mass. The Sunâ€™s gravity will be less. The planets will move further away from the Sun. After becoming a red giant, the Sun will start to burn helium and shrink. It will not be a red giant any more. It will use the helium up in about one hundred million years. Then it will become a red giant again. More gas will blow away for a few hundred thousand years. A planetary nebula will form. It could last for a few thousand to a few tens of thousands of years. It will glow in the light of the Sun. At the center, the Sun might shrink into a small star called a white dwarf. That kind of star is about the size of Earth. It would take about 100 of these white dwarfs to equal the size of the Sun today. The Sun will not have any more fuel. It will have lots of heat left over and keep getting cooler and dimmer. Then its light will go out in a hundred billion years from now. See also Drake, Stillman (translator) (1957). Discoveries and Opinions of Galileo (1610 Letter to the Grand Duchess Christina). Anchor, NY. ISBN 0385092393. Varadaraja V Raman (2000). Glimpses of Ancient Science and Scientists. Xlibris Corporation. ISBN 073881363X. page 339 "The Chaldeans ... were also the first to suspect... that the Sun, the moon, the planets and the constellation of stars, all affect human life and destiny.... These beliefs gradually spread .. to Egypt, China, Greece, India, and Rome, for example ... astrology is still very popular." 1. Which Scientist was first credited with suggesting that planets move around the sun? 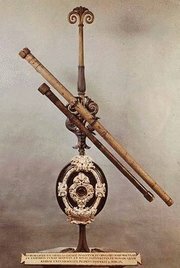 2. Who invented the telescope that helped to prove that planets move around the sun. 3. How was the solar system formed? a) from a left over gas and dust where the sun (a star) was born. b) when tiny pieces of dust hit each other and some of them stuck together, next the bits of dust slowly collected to form grains. c) our Solar System was created in a kind of cloud. 4. What is the difference between mass and weight? b) mass is the stuff everything is made of, weight is how much force gravity pulls. 5. Between what two planets is the Asteroid Belt?